We have been farming at Project Spectra for close to a year. The rooftop conditions are especially challenging with the heat and wind. Only certain plants that can adapt to these conditions do better at our garden, like beans and legumes. Biochar reduces nutrient leaching which is a major problem in places with very high rainfall, like the Amazon Rainforest and Singapore. Much of the plant nutrients are water-soluble and they get washed away during a heavy rain into the rivers (or in the case of SIngapore, the drains). Charcoal is extremely porous so they have a very high surface area to volume ratio and these pores hold on to the nutrients. The high porosity characteristic of charcoal also encourages microbial activities in the soil. They provide spaces for bacterial and fungi that help with the ecosystem of the soil. Biochar is slightly alkaline and helps to balance the pH of tropical soil, which is typically acidic. 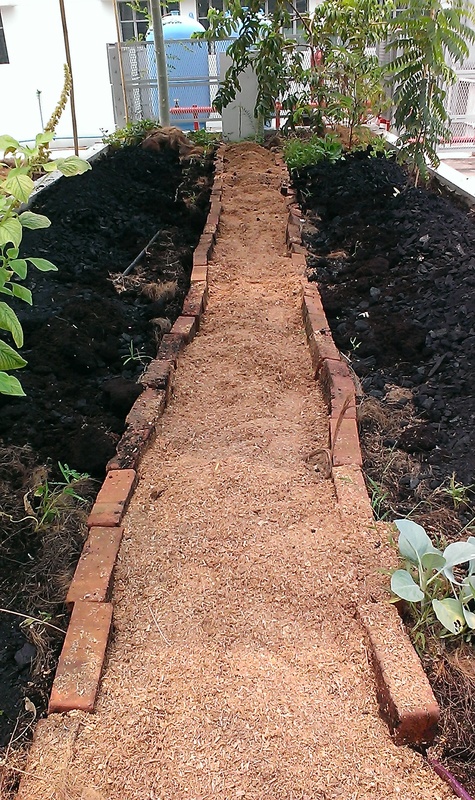 Biochar helps to moderate the wet and dry cycles in the soil. The numerous pores absorb moisture when the soil is wet and release them when the soil is dry. The roots of most plants enjoy a condition where it is moist enough but not too wet that they suffocate without air. Lastly, biochar will last a very long time in the soil. Unlike compost or ash, it doesn’t break down. This is why we still find Terra Preta in the Amazon after thousands of years. Talk about permanent agriculture!